Whether you are planning a day trip to Gig Harbor or a boat trip to Canada, there are several recommended planning steps to make your trip safer, more enjoyable and more successful. This Tech Talk will first review some sound trip planning advice. What resources will help plan your trip and what should you check before you leave? How to know what to expect along the way, how to identify particular hazards and how to keep you and your crew working well together during the trip. This Tech Talk will also discuss what to do when things go wrong. Ideally you will never encounter a serious boating misadventure. Being prepared to handle the unexpected is good practice in the event that you do. During this portion of the Tech Talk we will give teams a boating emergency scenario. Your team will develop a plan of action. Emphasis will be placed on assessing the situation, determining what to do, deciding if you need help, what kind of help and developing an effective distress call. 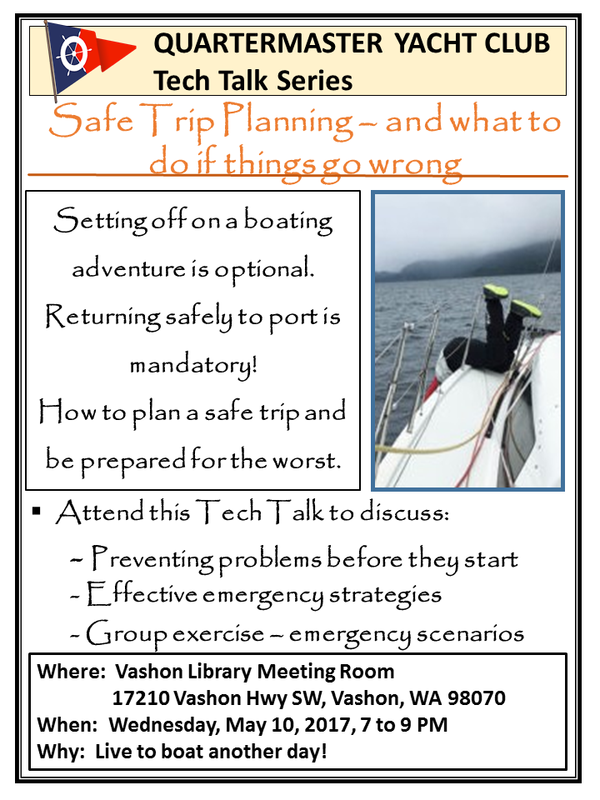 Bring your questions, your experience and your crew to this important Tech Talk on Wednesday, May 10 at 7PM in the Vashon Library meeting room.